As per usual at New York Fashion Week, I hit the ground running! Here are some of the looks I got to see and take in for Spring/Summer 2015. Tucked away in a hidden location in Chelsea, Manhattan, Nina Athanasiou held her S/S 2015 show on the 8th floor of a spacious loft overlooking the cityscape. Guests chatted amongst themselves about the round-about set-up of the runway and the projector set-up for the launch of her newest fashion video. Athansiou’s line consisted of pieces nostalgic of the 1950’s with an edgy, alternative twist. Going to a menswear presentation isn’t the easiest thing for a short girl like myself– everyone is about foot taller. I lucked out and hit the jackpot when after the show I happened to be standing right where the models got off their pedestals (actually) and left the show promptly to begin round 2 for the next round of guests. Seco, with his new womenswear line, had a full house attend at the World Trade Center venue. Seco incorporated the beading and warm multi‐colored details of the indigenous community into his classic, sophisticated style for men and women. He harmonized the collaboration by integrating simple pieces and classic silhouettes and added the fruit colored essentials in accessories such as handmade sunglasses, and his custom New Balance sneakers for men and women. My top pick this fashion week was hands down GEORGINE. The designer took 1970’s glamour to the next level with the bathing suit inspired eveningwear of Saint Tropez. The collection consisted of luxurious golds, rich creams, shimmering metallics and fresh mint. Looks were accessorized with mink tote bags and beach towels as well as leather clutches in the shape of surfboards in collaboration with Max Steiner Design. I’d buy everything in the collection: OBSESSED. Join the obsession and check out her Spring/Summer 2015 line. Perfect for a walk down not only the boardwalk, but fifth avenue gallivanting. You’re welcome. 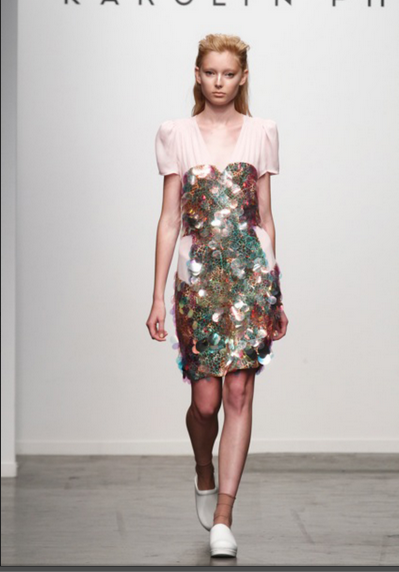 At Pier 59 Studios this fashion week, Karolyn Pho presented her 5th season, and 2nd runway show. Her line’s story followed a traveling woman with abstract views and perceptions. A masculine, utilitarian-esque womenswear line with a soft pastel palette and splashes of sequins here and there walked down the runway.